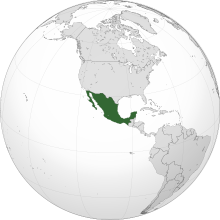 Mexico, or the Mexican United States, is located in North America. It is bordered by the United States, the Pacific Ocean the Gulf of Mexico, and Guatemala. It is governed by a Federal Presidential Constitutional Republic, with a size of 1,972,550 square km. Mexico gained its independence from Spain on September 16, 1810.